Richmond Dental and Medical exhibited at the California Dental Association’s annual conference in Anaheim, May 4-6, 2017. There were 21,064 pre-registered guests. Even though attendance was down 2% from the previous year, with 26,522 attendees, we were busy with booth traffic. Our mirror-like Reflective Shields Plus®, which illuminate the back quadrant, while retracting the cheek. They do not stick to the mucosa; however, provide superior absorption without compromising the work area. Dental practices love our sterilized, prepackaged, 8-ply SteriPocket® Sponges to hand to patients after an extraction. It saves the practice time and money from wasting too many sponges, while having to autoclave them in-house. The Dental Advisor voted our SteriPockets a preferred product, as well as Editor’s Choice. Richmond’s Level III Path-O-Guard™ Earloop Face Mask, awarded 4.5+ by The Dental Advisor for its breathability and comfort, offers bacterial filtration ≥ 98% efficiency. Another show stopper was our EZ UP® Pellet Dispenser which accommodates our 100% cotton pellets sizes #1 through #5. Our autoclavable braided roll dispensers and nonwoven sponge dispensers are also favorites of many practices. Dentists attending totaled 6,577, compared to 6,700 in 2016. There were 5,312 RDAs; 2,654 RDHs; 93 Lab Techs/CDTs; 2,771 office staff; and 2,454 other students, guests, and press. 590 companies exhibited, accounting for 6,661 people. This was an increase of over five percent from the prior year. The Anaheim Convention Center provided 135,000 square feet of exhibit space for new and existing products and services. Most of our contacts were from the West Coast, especially California, and the Midwest. Some international dental providers were in attendance and eager to import our products. The CDA offered 175 Courses and Workshops with CE accreditation. Many dental professionals participated in the Dental Trends Panel and lectures. 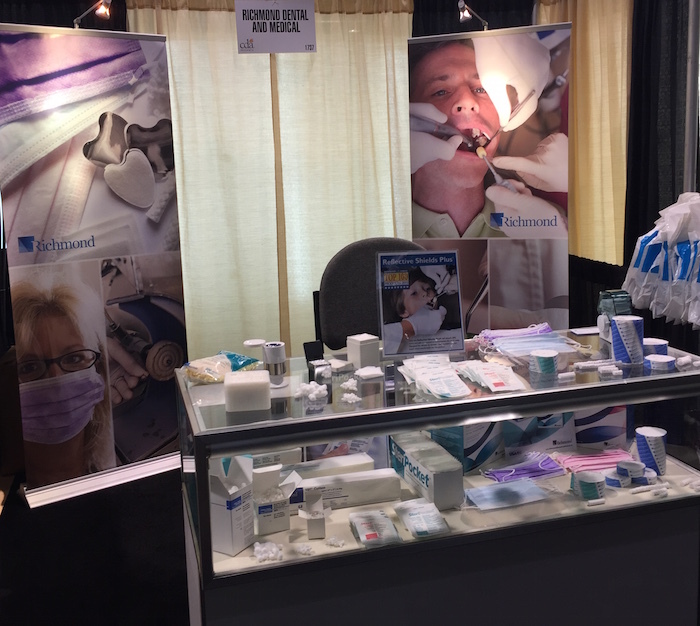 At the Richmond Dental and Medical booth, we continued to give away product sample bags. In addition, we offered show specials for orders placed during the show. We look forward to another successful CDA in Anaheim, May 17-19, 2018. In the meantime, please visit our library at https://www.richmonddental.net/library/. Please feel free to contact us toll free at 1-855-841-0743, during normal business hours, from 8 am – 5 pm, EST.